Click the clipboard and find out more about what you will need to be prepared. What do our guests say about hunting at the Flynn Ranch? The Flynn Ranch is proud to be a sixth generation, 20,000 acre working ranch located in beautiful South West Montana. The ranch has roots extending far into the past, settled in 1873 by Jefferson and Anthony Sharp. As the ranch has evolved over the years with the passing of generations and the additions and improvements, it has in essence become bigger than the sum of its parts. Those of us following in the footsteps of the pioneers, truly have large boots to fill! We are proud to offer Flynn Ranch Hunting as one of our many services. 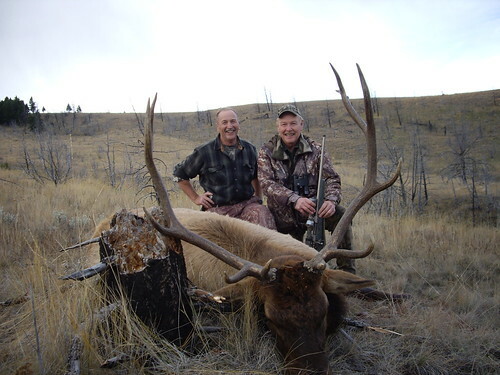 We have abundant wildlife and offer Elk, Deer and Antelope hunts. Our hunts take place on our privately owned and leased ground. Here at the Flynn Ranch we stay busy year round running 600 head of Black Angus cows and raising good, healthy calves. We also grow quality alfalfa and wheat. All of our guests really enjoy being a part of our family run ranch and many are return clients who have become great friends over the years. If you are looking to book a quality hunting trip, need hay or cattle, browse through our website and feel free to check out our photo gallery. We hope to see you at the Flynn Ranch!